Buena Vista (/ˌbjuːnə ˈvɪstə/) is an unincorporated community in Elizabeth Township, Allegheny County, Pennsylvania, United States, located just outside Pittsburgh on the Youghiogheny River. The Great Allegheny Passage rail trail runs through the community. Buena Vista was laid out in 1849 by James B. McGrew for the heirs of Daniel Greenawalt. For a time, it served as a mining town. Like many places in the US with this name, Buena Vista was named for the 1847 Battle of Buena Vista during the Mexican-American War. Notable people to have come from Buena Vista are former baseball players Bill Ford and Brian Holton. 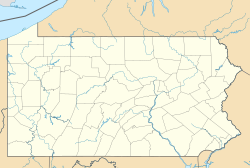 ^ History of Allegheny County, Pennsylvania. 2. Chicago: A. Warner & Co. 1889. p. 92. ^ "History of Buena Vista Furnace Historic Site". Indiana County Parks & Trails. Retrieved 2016-08-12. ^ Meyer, Paul (30 April 1987). "Buena Vista's Holton Finally Reaches Big Time". Pittsburgh Post-Gazette. Retrieved 26 June 2012. This page was last edited on 6 March 2019, at 12:16 (UTC).